Mushroom lovers rejoice! These vegetarian Stuffed Mushrooms are loaded with marinated artichoke hearts, two cheeses, and scallions. Top them off with buttery breadcrumbs, then bake until golden brown and bubbly! Everything can be prepped and assembled the day before (in 30 minutes or less!). No one is on the fence about mushrooms: You either love ’em or you hate ’em. If you hate them, come back tomorrow to see what else I’m cooking! 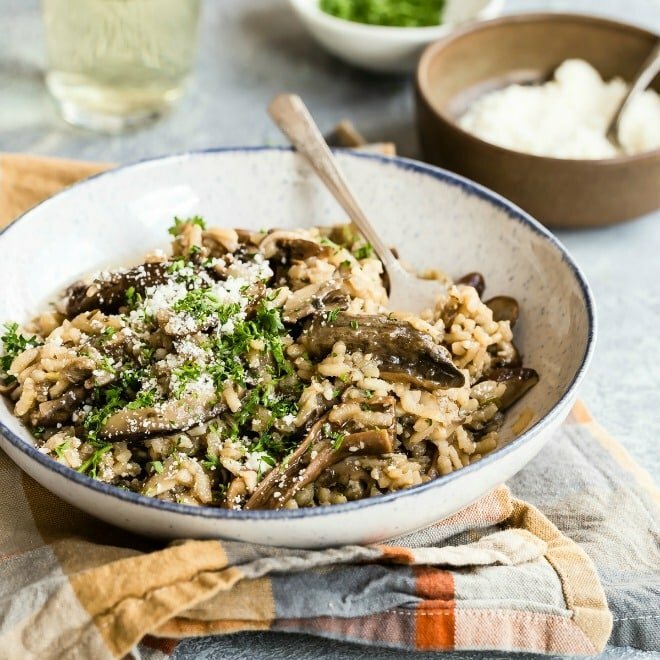 If you’re a mushroom lover like me, you’ll want to try this recipe ASAP. What do you stuff a mushroom with? This filling starts with a combination of cream cheese and Parmesan cheese so it’s warm and gooey. I added a bit of mayonnaise for a creamier texture and some sliced green onions for color (and because they taste so good!). To all of that, stir in a the star ingredient: a jar of finely chopped marinated artichoke hearts. They have a rich, briny flavor with a hint of sweetness. Feel free to bust out your food processor to make chopping easier! How do you make breadcrumbs? Homemade breadcrumbs are easy to make and they taste so much better than store-bought bread crumbs. If you the freezer space, get in the habit of saving the heels of stale bread in the freezer. If you’re using fresh bread, you can dry it out in a 300-degree oven in about 15 minutes (just place it on a baking sheet). Pulse the bread in a food processor or blender until finely ground (add the bread in small batches). Alternatively, smash the dried bread in a bag with a rolling pin. What temp do you cook stuffed mushrooms? 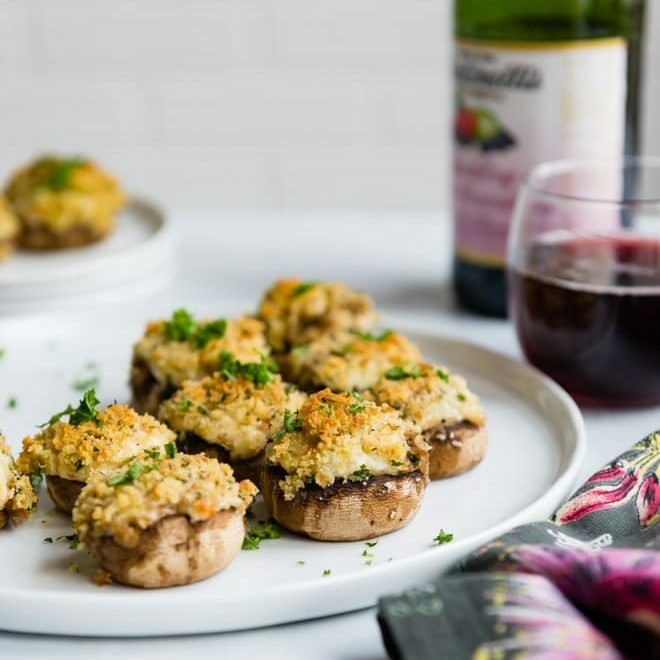 Bake these vegetarian stuffed mushrooms in a 350-degree oven for 12 to 15 minutes, until golden brown and bubbly. How long can you keep mushrooms in the fridge? Raw mushrooms are best left whole and stored in the refrigerator in a paper bag. They will keep about 4 to 7 days this way. 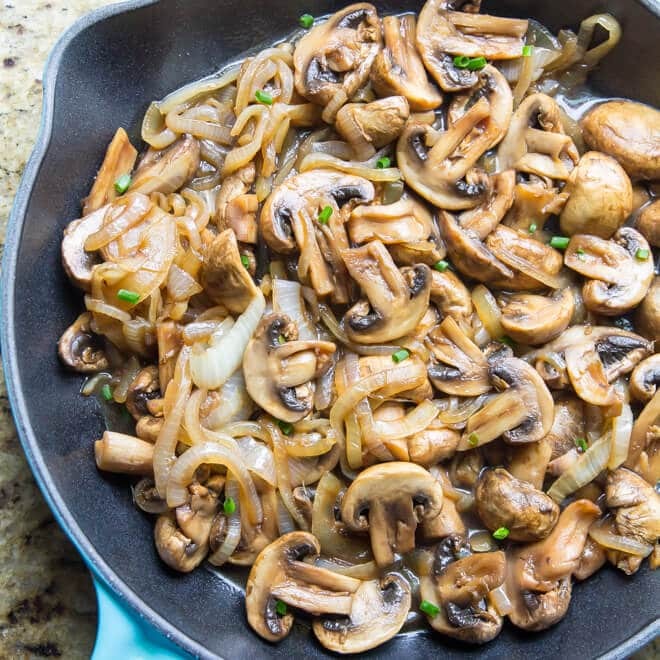 Chopped or sliced raw mushrooms will last about 1 to 2 days in the refrigerator. For this reason, I always purchase whole mushrooms and slice them myself unless I’m using them immediately. 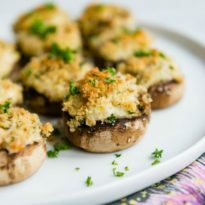 What cheese is used for stuffed mushrooms? I always start with cream cheese and then add something else, in this case Parmesan but mozzarella is also a good choice. Cheddar, Gruyere, and Swiss are also delicious depending on your other filling ingredients. In my Crab Stuffed Mushrooms, I use a combination of cream cheese and mozzarella. Amazing! 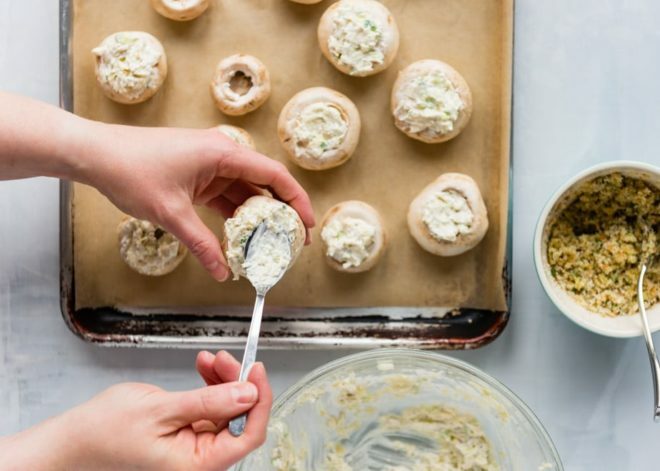 Can you make Stuffed Mushrooms ahead? You can easily prepare them in advance by cleaning the mushrooms and removing the stems; cover and keep in the refrigerator until stuffing time. Mix the filling in advance too; it will actually taste better since the flavors will have more time to blend. Want mushrooms for dinner? Check out my Stuffed Portobello Mushrooms. 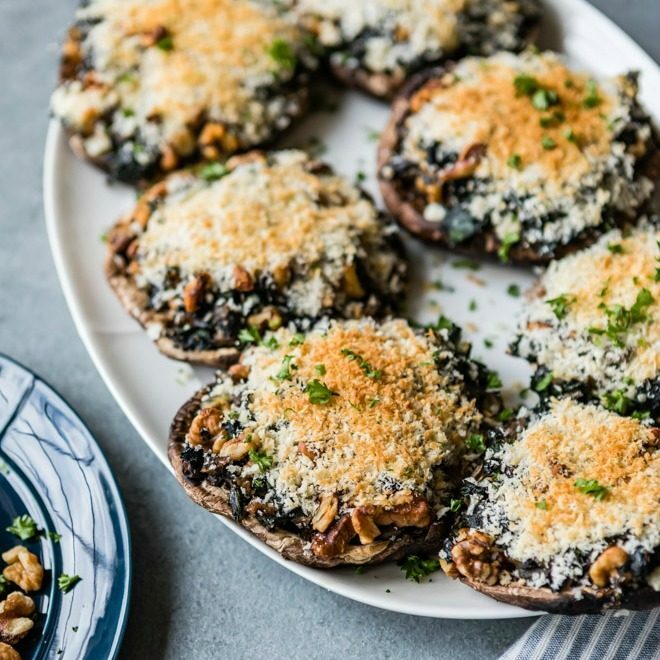 Filled with spinach, walnuts, and gorgonzola cheese, these stuffed portobellos are healthful, delicious, and vegetarian. 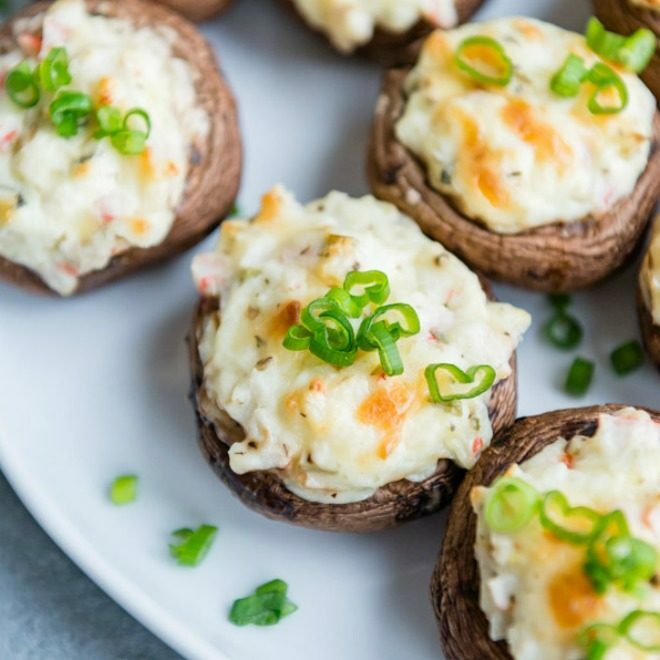 Save these Vegetarian Stuffed Mushrooms to your “Appetizers” Pinterest board! Mushroom lovers rejoice! 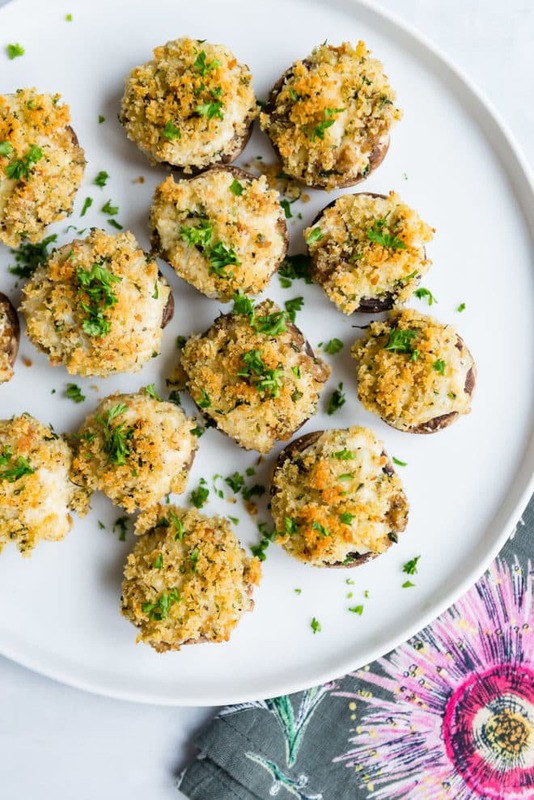 These Vegetarian Stuffed Mushrooms are loaded with artichokes, two cheeses, and breadcrumbs then baked to hot, cheesy perfection! 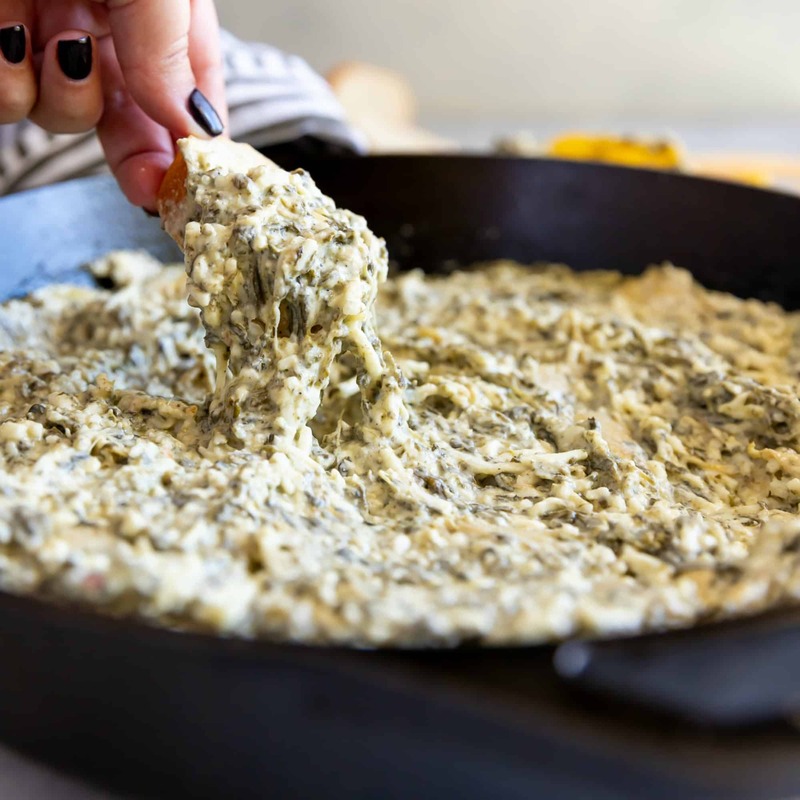 In a medium bowl, combine artichoke hearts, cream cheese, Parmesan cheese, mayonnaise, and scallions. Stir until uniformly combined. Arrange mushrooms on baking sheet. Using a small spoon, fill the insides of the caps with the filling and mound additional filling on top of the mushroom. In a small bowl, combine breadcrumbs, Italian seasoning, and olive oil. 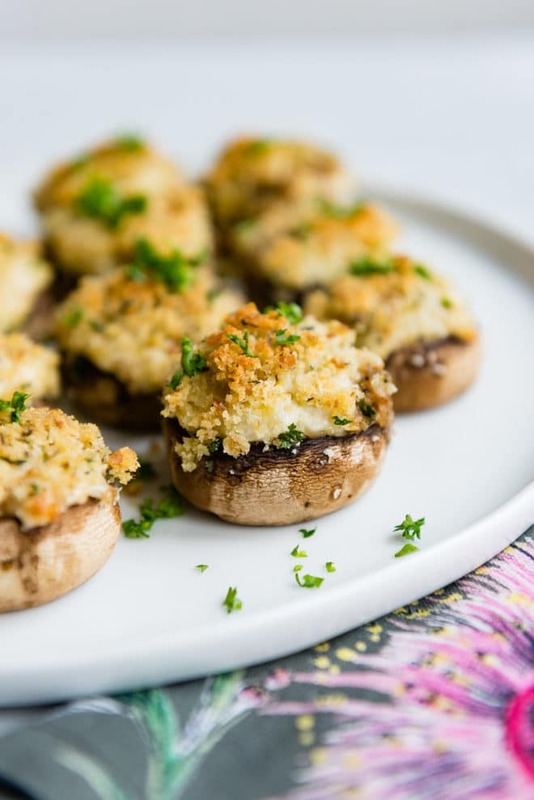 Using your fingers, divide the breadcrumbs among the stuffed mushrooms, pressing the crumbs into the filling. 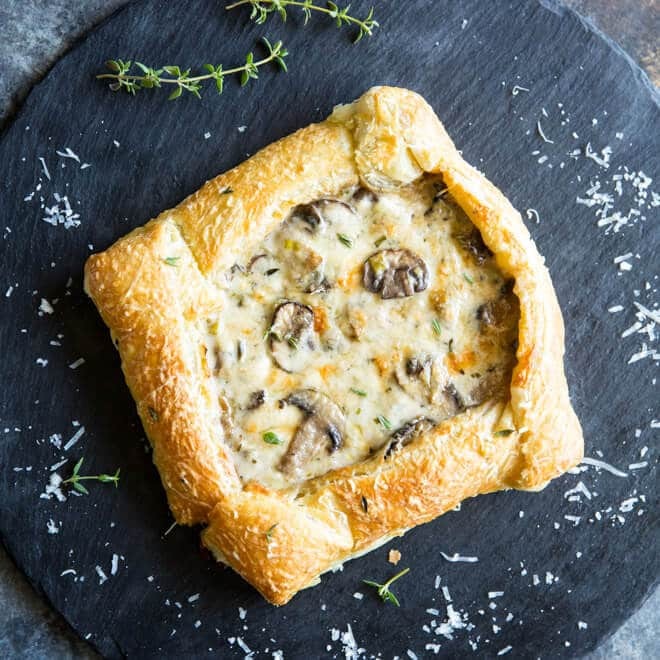 Bake for 12 to 15 minutes, depending on the size of the mushrooms, until the bread crumbs are golden brown and the filling is heated through. Serve warm. Thank you so much Cindy, I hope you love them! I love all mushrooms and I love the meatiness they can give to a vegetarian dish. Great recipe. These fall under the “accidentally vegetarian” category where us meat-eaters can’t stop shoveling them in! Hi, Meggan! I’ve heard of an appetizer with mayo and artichokes that reminds me of this dish, but using the mixture to stuff mushrooms is genius. I love the sound of these! I love mushrooms and artichokes, but never paired them together. Will try to recreate this recipe. Pictures look amazing! Such a clever appetizer, Meggan. I remember my dentist telling me about an appetizer with a similar filling, and she raved and raved about how delicious it was. These look and sound awesome Meggan! How many stuffed mushrooms does this make? The recipe says it serves 6. 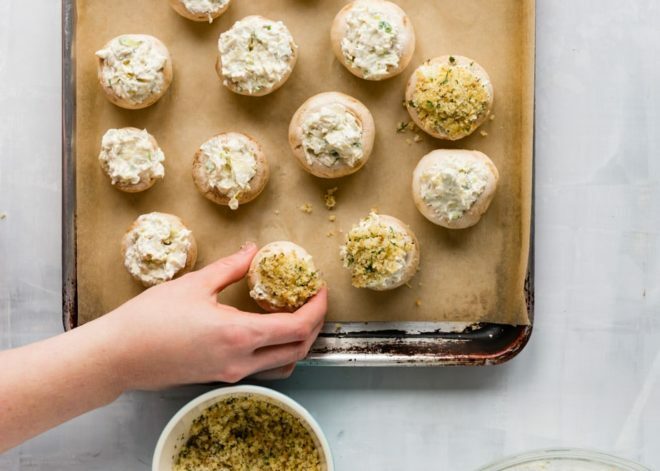 Is it only 1 stuffed mushroom per serving or…?